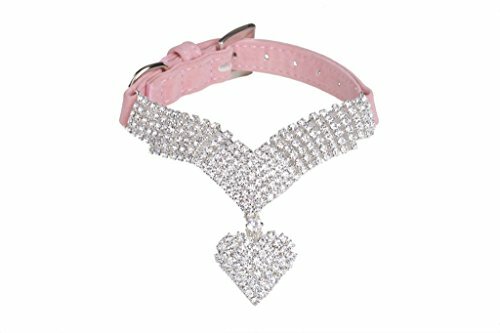 Didog - Cute PU Leather Dog Collar - Rhinestone Flower Pattern Studded - 1 Inch Width Fit Small and Medium Dogs,Pink 11-13"
Rhinestone Dog Collar for Small Medium Dogs*Brand name :Didog*Size ChartS:11-13";M:12-15" *Material: PU leather *Classify:Flower Studded Rhinestone dog collar *Feature 1: Strong * Durable : soft PU leather material,strong stitching for long use *Feature 2:Cute * Filmy :Diamond flowers studded by hand ,bling bling for female pets wearing *Feature 3:Handcraft * Adjustable :there are 5 eyelets adjustable with a metal D-ring studded ,very sturdy for leash attaching *Feature 4:Fancy * Charming:Ideal for weddings,holidays,parties and pet shows *Please note that we are manufactory products,price is competitive and quality guarantee. *If you have any dissatisfaction with the product quality and service,please contact me first.I will solve your problems as soon as possible. 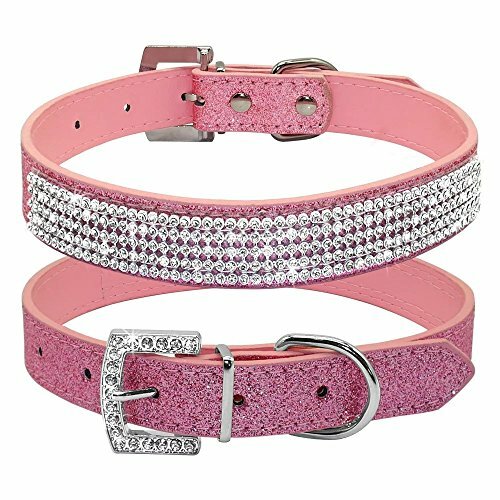 Beirui Rhinestone Bling Leather Dog Collar & Leash Set - Soft Flocking Sparkly Crystal Diamonds Studded - Cute Double Bowknot - Perfect 4 Foot for Pet Show Neck for 6-8"
Beirui Rhinestone Bling Leather Dog & Cat Collar & Leash Set - Soft Flocking Sparkly Crystal Diamonds Studded - Cute Double Bowknot - Perfect 4 Foot for Pet Show & Daily Walking Color :Lovely Pink and Enthusiastic Red Feature: Sparkly Crystal Diamonds Studded - Double Cute Bowknot Package:1 x Glitter Adorable Dog Collar and Leash Set Size Information Size------Neck Adjustable-----Total Collar Length-------Total Leash LengthXS----------8-10"-------------------12"-----------------------4 FT----- S-----------10-12.5"----------------14.5"---------------------4 FT----- M-----------12.5-15"----------------17"-----------------------4 FT----- About return policy: If you are not satisfied with our product or order wrong item, let us know at the first time, we promise to reply you in 24 hours. If we make a mistake, we promise to resolve it for you immediately About our services If you have any questions, please leave your messages by email, we promise to reply you within 24 hours and offer you best services If you are not satisfied, before you leave the Negative/Neutral feedback, contact us and let me know that, we will resolve the problem till you satisfy. 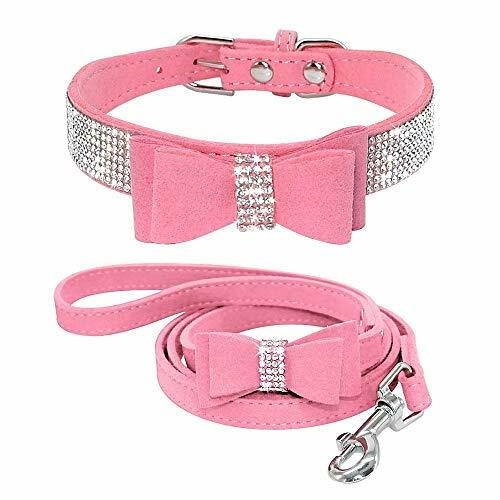 B-ling B-ling Collar Size :S 12-15" M 13.5-16.5" L 17.5-21.5" Brand name :Didog Material: Comfy velvet material Classify:Diamond rhinestone dog collar Feature 1:Solid colored pure dog collar for girl,female dog breeds Feature 2:2.Much diamond studded on the collar, beautiful crown shape appearance,good for dog show,outside walking Feature 3:The dog necklace is soft and skin - friendly to pet skin,dont worry about the spikes hurt Feature 4:5 Eyelets adjustable and there is a large D-ring studded easy for leash attaching Please note that we are manufacture products,price is competitive and quality guarantee. *If you have any unsatisfactory with the product quality and service,please contact me first.I will solve your problems as soon as possible. PetsHome Introduction Pets Home is an all-embracing shop for all pets and pet-owners. It builds on our great enthusiasm to improve the living standard of pets and pet-owners. Pets Home will perservere in our efforts to give you the best products and services. With the effort of Pets Home, you and your pets will enjoy a better tomorrow. 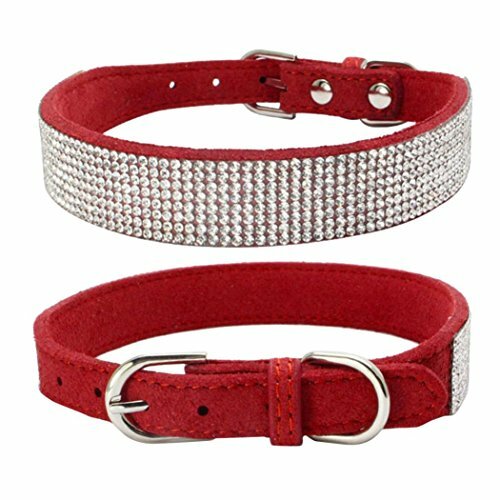 Dog collar with high quality diamante jewelry decoration.1, Made of soft velvet pu leather material, will not hurt your pets. 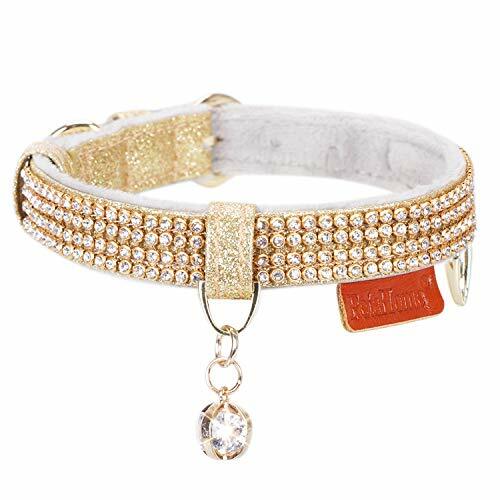 2, Crystal neck collar with diamond pendant, the buckle is alloy and silver plated. 3, 2 sizes available from XS 1/2"*7-9", S 1/2"*9-13". There are 5 eyelets for neck adjustment. 4, There are 3 colors for you choose: Red, Pink, Rose. 5, It's a best choice for your pets in the party time, makes your dog look like a princess. 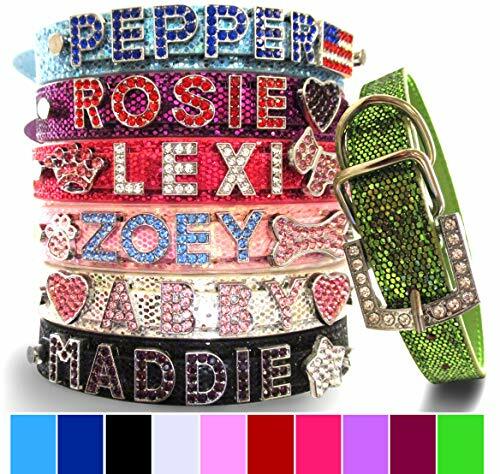 6, It has a surprisingly adaptable collar for a wide variety of sizes of dogs or cats. Notice: 1, Please measure your pets neck girth correctly, not too tight or too loose. 2, Please keep them in the dry bag if you not use them. 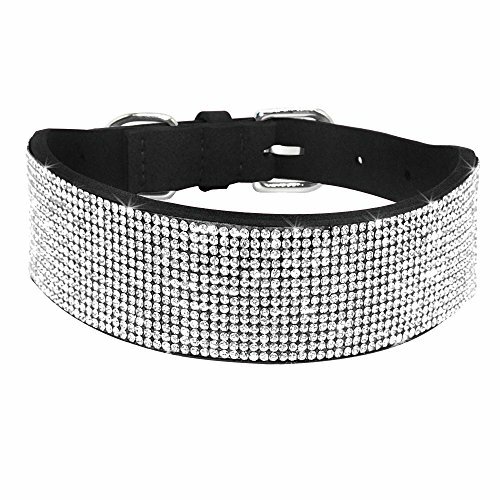 Shopping Results for "Rhinestone Collars Dog Collars"